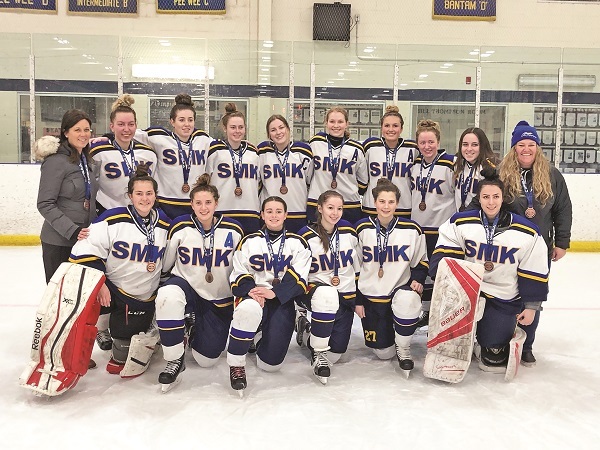 The York Region champion Mustangs earned a bronze medal finish at last weekend’s OFSAA championship tournament, held in Midland to pit Ontario’s regional champions against one another on the ice. The Aurora squad, based at St. Maximilian Kolbe Catholic High School, were up to the task offensively from the get-go, posting a 6 – 4 win over St. Peter’s of Barrie in the opening game of the round robin, also besting Ancaster’s Bishop Tonnos School 6 – 2 to advance to the quarterfinal matchup. There they met St. Peter’s of Peterborough, the winners of the Group D division, advancing to the semifinal round by way of a 4 – 1 final. London’s Medway High School was the next opponent, the winners of the last two OFSAA championships. St. Max finally met their match in a 3 – 1 loss, sending the Mustangs to the bronze medal game versus Mississauga’s Mount Carmel. Determined to respond from their finals elimination, Lara Jorgensen, Meghan Anderton, Jacey Dane, and Julia Cuccia each found the back of the net to secure the bronze for the Mustangs in a 4 – 1 victory. Erynn Visser was between the pipes for the win. Both Thompson and Dane are moving out east to play at the collegiate level next season, with Thompson heading to Nova Scotia to compete with the St. Francis Xavier X-Women, and Dane suiting up for the St. Thomas University Tommies in New Brunswick. The Mustangs booked their ticket to the provincial championship via their fourth-straight YRAA title over Stouffville High School in early March. Congrats go out to St. Max team members Kendra Keyes, Jordan Rooney, Lara Jorgensen, Larissa Keyes, Julia Cuccia, Olivia Tonelli, Meghan Anderton, Erynn Visser, Jayden Thompson, Natalia Forrester, Jacey Dane, Nicki Rice, Melissa More, Katie Howe, Claire DiLosa.